Guada Respicio Duque, M.D. earned a B.S. degree in Nursing and an M.S. in Health Evaluation Sciences from the University of Virginia, Charlottesville, VA. During her undergraduate years, Dr. Respicio Duque was tapped for membership in Phi Eta Sigma Freshman Honor Society, Golden Key National Honor Society and Sigma Theta Tau International Honor Society. She obtained her medical degree from St. George’s University, Grenada in 2004 and completed her Internal Medicine Internship and Residency at the University of Connecticut, where she served as the Chief Medical Resident and received the Philip T. Goldenberg, MD Award for Leadership in 2007. Prior to joining Arthritis and Rheumatism in 2010, Dr. Respicio Duque completed her Rheumatology Fellowship at the University of California, San Francisco, CA. Dr. Respicio Duque has worked as a Registered Nurse, served in leadership roles and participated in teaching activities throughout her years of education and training. She has co-authored numerous publications and has presented abstracts at the regional, national and international conferences. She has experience in all areas of rheumatology and has a special interest in Systemic Lupus, Sjogren’s Syndrome, Osteoporosis and Gout. Dr. Respicio Duque is an Assistant Clinical Professor of Medicine at Georgetown University, School of Medicine Division of Rheumatology. She is board certified in Internal Medicine and Rheumatology. She is a fellow of the American College of Physicians and a fellow of the American College of Rheumatology. She is a member of the Montgomery County Medical Society and the Rheumatism Society of the District of Columbia. 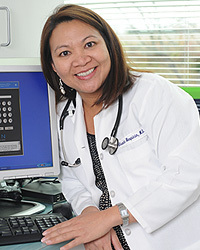 She has been recognized as an outstanding specialist in Rheumatology in Washingtonian Magazine.